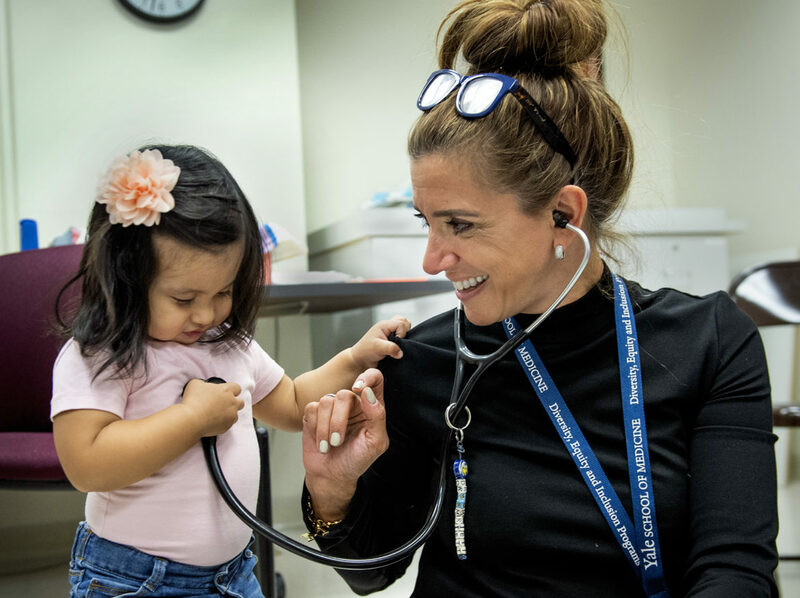 Amilla, 16 months, places Dr. Marietta Vázquez's stethoscope over her heart. But these days when front-line clinicians encourage families to use the many services offered through federal public programs, parents have questions—and misgivings. In this podcast, C-HIT reporter Colleen Shaddox interviews Patricia Nogelo and Dr. Marietta Vázquez about the chilling effect the proposed public charge rule change is having on immigrant families. The proposal, by the U.S. Department of Homeland Security (DHS), would allow the federal government to consider immigrants’ use of public benefit programs, such as Medicaid (HUSKY), food stamps and housing assistance, as a reason to deny lawful permanent residency, also known as a green card. The change in the so-called “public charge” rule is awaiting final action by DHS. The American Academy of Pediatrics is among a number of organizations condemning the proposed rule change. “It’s just another thing that is weighing down so heavily on these vulnerable women and children,” said Alicia Kinsman, director of immigration legal services with the Bridgeport-based Connecticut Institute for Refugees and Immigrants. Kinsman said she encourages her clients not to give up assistance with housing, food and other necessities—but they are forgoing these benefits anyway. Greater Hartford Legal Aid has developed a factsheet to help explain the current law and the proposed changes. According to the factsheet, for immigrants who have green cards using benefits like the Supplemental Nutrition Program for Women, Infants and Children (WIC), SNAP (food stamps) and Medicaid will not affect their immigration status. The proposed rule change only applies to someone applying for a green card or seeking admission to the U.S. from abroad. Lucy Potter and Christina Gill, lawyers at Greater Hartford Legal Aid, drafted the factsheet. They and their colleagues are reaching out to human-services and health care providers about the proposed rule change, which is very technical. Crystel, 15 months, cries as she gets a vaccination form RN Cinthya Chumpitaz. Crystel is held by her mom, Audelina. There have been many misinterpretations and miscommunications of the proposed rule change, Potter said, adding that the proposal “is meant to terrify.” She said DHS states that cost savings from the rule will result from discouraging people not even subject to the rule—legal immigrants and those who have become citizens—from accessing benefits for which they are eligible. Customs and Immigration Service (USCIS) spokesperson Michael Bars declined to respond to Potter’s allegation that the rule is designed to create confusion that stops immigrants and their children from accessing benefits. 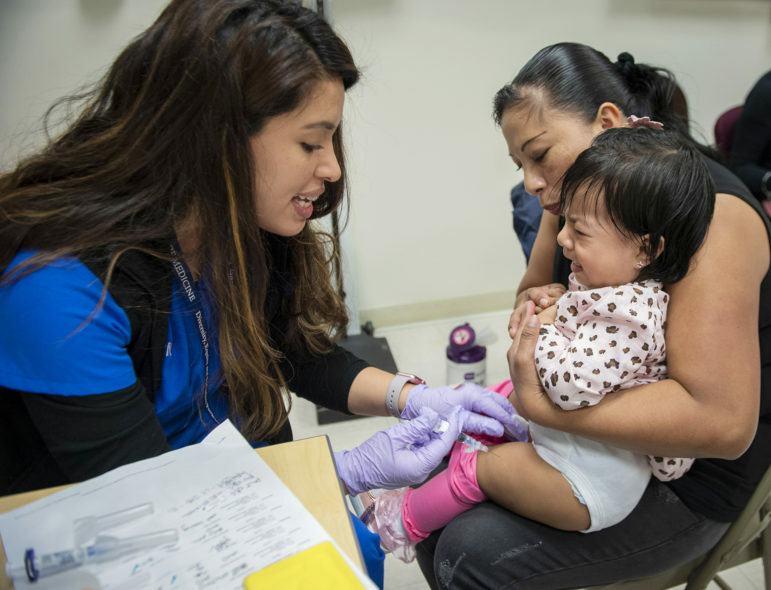 At the Yale Children’s Hispanic Clinic, patients are still coming to appointments, and many are benefiting from the federal nutrition program WIC. 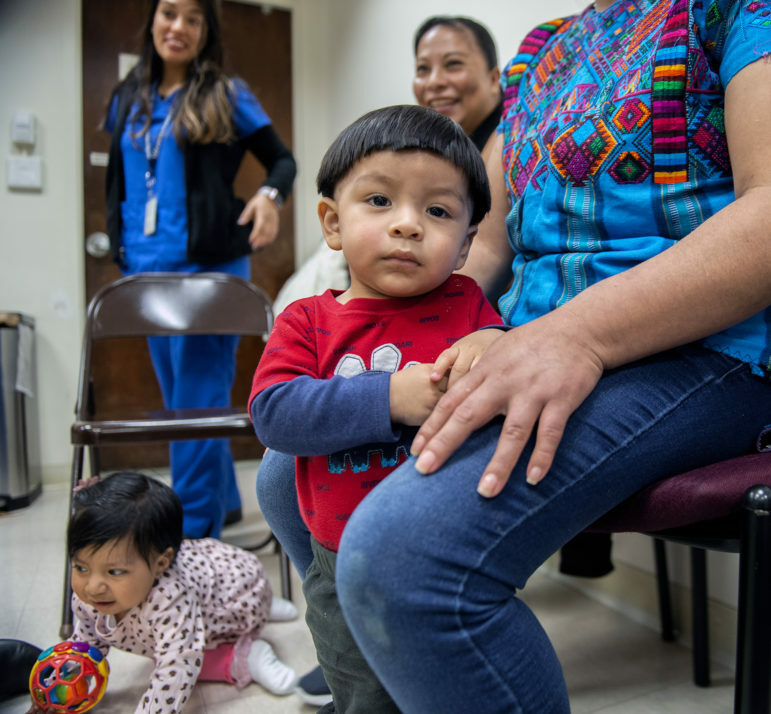 “But we don’t know in particular what other resources families … are choosing not to participate in,” said Dr. Marietta Vázquez, the clinic’s medical director. “It’s really a concern.” She said she treats children who fear that they will come home from school to find their parents have been deported. “It’s tragic,” she said. Andy, 15 months, rests against him mom, Paulina, as he checks out the activity at the clinic. Crystel crawls on the floor. To view the factsheet by Greater Hartford Legal Aid, click here.